Before we hop in, just wanted to take two sentences to talk about my outfit. I love wearing a matching set and this definitely fits the bill! I mean who doesn't love a good windowpane dress/balzer combo that's also rather affordable? I feel like wearing something similar to this to an interview is dressed up (but not too much) without being old and boring about it! 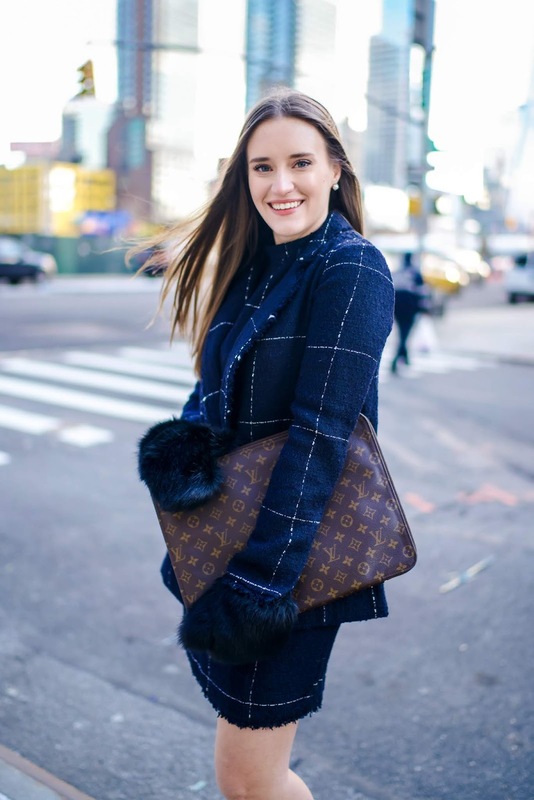 Also this post gave me a pretty good excuse to break out my LV portfolio that was a wonderful gift from my mom around the time I moved to New York! So lets hop into the meat of the post and share your (and mine!) best tips for interviews. Thought I would break it out into before, during and after to-dos and tips. There are some really helpful and valuable lessons here that you can apply to a ton of places in your life. I hope it may help whomever is reading this. Get ready for the commonly asked questions like "tell me about a time when you didn't agree with your supervisor"or "tell me about a time you didn't succeed" -- you know the ones I'm talking about! We all ask the same questions with a similar degree of difference. So prepare for that! Mock interviews with friends, mentors, family. Practice in the mirror. Use flip cards -- whatever helps you the best! Get ready to talk money. Even if it doesn't come up in the interview, it's best to be prepared. Know your worth, be ready to defend it. Be strong, brave, steady, calm. Know the industry and do your research on your position. What is fair, what is doable. And practice these negotiations! You can do it -- you just have to fight for it. Do it early and often. Arrive so early that nothing could have a chance at making you late. There is nothing worse than someone who is late. Arriving early is curious and it shows you care. Think of meaningful questions to ask. Prepare to ask some questions! This interview is a two way street and a conversation. They want to see you've done your homework, came prepared and have really put thought and emotion into your interview. Ask them the easy things like what they like best about the company but also don't be afraid to ask some hard hitting questions like what about my resume/experience most concerns you. Be nice to everyone in the building. This should be you all the time always. But you never know who is who and also being nice and happy makes you a happy person! Don't have your phone out. Seriously, turn it off, burry it in your bag and don't even think about it until you're out of the building. Aint nobody want to hire a dead fish. Don't be thinking about the next question, your answer form before, what you're having for lunch -- just LISTEN. And listen with intent. Lean in, show them with your eyes and body language that they have your attention. Take in what they are saying, understand it and use it to help you in the interview. Stand up and move around-- it will get your energy up and it will come across in your voice. And always always always smile when you're talking. Do this in person too! You can hear it in your tone and voice and it will also help you relax and feel happier. I'm not talking like a gown or anything but it's always better to be overdressed than under. Even when applying to a casual office, it's always best to look your best. Plus you FEEL better when you're dressed up. Wear your power color, wear what makes you feel good! Not talking about the boring stuff -- but your resume! Bring a hard printed copy of your resume, your cover letter and even some samples of your work. Put it in a folder for them to keep and bring multiple of them. You never know who might pop in and you always want to have more than not have enough. Obviously be yourself (always) but be real in your responses and weaknesses. I know growing up we're taught to share our lowest strength "my weakness is being a perfectionist!" -- people just see right through it. Be honest with your responses (that you've thought about and prepared!!) and share a real flaw or weakness and share how you're either working on it or how you've been able to overcome it. About your previous employer, your boss -- anyone! Talking bad about other people in general is no way to showcase yourself. It only in turn hurts you and how you look. This goes hand in hand with being confident/faking confidence -- let your body language speak for itself. Sit up straight, lean in when appropriate, maintain eye contact -- the main things to showcase you are interested, eager and confident in yourself and your ability. Make sure you always answer the question. Don't skirt around, be straight forward (don't ramble in general) and make sure what you've said answered every part of the question. There is nothing worse then waisting time and still not getting an answer to what you were looking for. Never be afraid to take a moment to answer a question. Think about what you're trying to say, take a moment to yourself, calm your nerves -- it's ok! Wether it be via email or personal note card, always make sure to follow up and thank the person/people who took time out of their day to meet with you. In general this is good practice and is almost so common now it's a big strike against you when you don't do it. It's never too early to send it but don't wait longer than 12 hours to do so. Also, never send from your phone! A good rule in general. If you don't get hired, don't be afraid to ask why. Every loss is a learning experience (just got that from Game of Thrones tonight lol). Ask them what you can do better for next time, what you can work on, their thoughts on your interview -- people are always happy to help and give feedback where they can. Do you have any more tips to share? Would love to hear them below! Can you do a post on various outfits to wear to a job interview?